If you have always wanted straight teeth, but metal braces just don't match your lifestyle, Invisalign clear aligners from San Diego & La Jolla Invisalign preferred provider Dr. Charles Briscoe might be exactly the solution that you need. Clear. Removable. Practically Invisible. What is it? Invisalign is a teeth-straightening system that is perfect for adults. Using a series of clear plastic aligners, Dr. Briscoe will gradually move your teeth into their correct positions. Your teeth will be moving, your crooked smile straightening — and no one will notice that you are wearing the aligners. You can remove the aligners at any time: to eat, to floss, or for a special occasion. You'll just continue with your program, changing the aligners about every two weeks until your teeth have moved into the desired location. Invisalign has become a wildly popular teeth straightening option for professionals in San Diego & La Jolla desiring attractive, straight teeth without the commitment of traditional metal braces. Dr. Briscoe takes great pride in providing among the best results with Invisalign San Diego has available, giving his patients something to smile about. Dr. Briscoe has helped hundreds of people straighten their teeth, providing his patients with some of the most beautiful results with Invisalign La Jolla has available, and he can help you to do the same. As a fully accredited Invisalign® dentist practicing in La Jolla Dr. Briscoe is fully qualified to thoroughly evaluate your teeth and your bite in order to ensure this is the correct procedure for you. If you can achieve your goals with Invisalign®, he will take x-rays and digital images of your teeth and will make impressions of your bite. This information is sent to the Invisalign® laboratory where it is used to create 3-D images of your teeth. Dr. Briscoe then constructs a treatment plan based on these findings which includes the exact movements of your teeth while under treatment and which will help predict the amount of time it will take to achieve your goal. Typically for an adult the treatment will take about a year. Teens are good candidates for Invisalign® for several reasons. The most obvious reason is that the process is difficult to detect as the alignment trays are made of clear material. Only close friends will know. This is especially good for teens who are self conscious and don’t want to deal with a mouth full of metal during middle or high school. Another reason is that Invisalign® trays are removable which makes it possible for teens to play musical instruments, participate in sports and hang out with friends eating popcorn and other foods forbidden to those wearing metal braces. Dr. Briscoe has many patients of all ages that see him for Invisalign clear braces in La Jolla. The next step involves making customized aligner trays. Using the information from the evaluation step, a series of trays are made which will gradually move the misaligned teeth to their correct position. The aligners are made from crystal clear BPA-free plastic. Unlike metal braces, they are very smooth and won’t irritate your gums or the inside of your cheeks. The aligners are designed to allow a gentle gradual movement of your teeth. Dr. Briscoe is available to answer any questions or deal with any issues that come up during treatment. He is an elite Invisalign® dentist serving La Jolla and San Diego with thousands of happy patients and stunning before and after photos to share with his prospective patients. Another benefit is your La Jolla Invisalign clear braces can be removed at any time to allow you to eat the foods you want and to allow you to maintain dental hygiene throughout your treatment. Of course they can be removed for special occasions. Best results are obtained when they are consistently worn for 22 hours per day. You will continue to move to the next aligner approximately every two weeks. This slight change in the aligner will advance your treatment until your teeth have moved into the correct position. About every six weeks, you will see Dr. Briscoe so he can monitor your progress and make any adjustments necessary. As you progress from aligner to aligner you will be able to see your goal coming closer and closer. Most people won’t notice your aligners and you will be able to achieve your goal without having to give up favorite foods and without the irritation of metal braces. Since the aligners can be removed for short periods of time, your lifestyle will not suffer. Go ahead and have some pizza or munch on popcorn. Why Choose Dr. Briscoe for your Invisalign Treatment? Dr. Briscoe's expertise and extensive training background lay the perfect foundation for gorgeous orthodontic results at La Jolla Dental Care. Dr. Briscoe takes his time to fully understand your orthodontic needs, and to correctly assess your teeth and recommend the best treatment plan. When it comes to Invisalign, he can provide you with a simple, yet highly effective treatment plan. "Dr. Briscoe is a great orthodontist and his staff are wonderful. I wore Invisalign per his recommendation to finish my orthodontic treatment and my teeth look beautiful. I'm very pleased with the results and I would definitely recommend him for orthodontic work. Initially, I was nervous about starting treatment all over again and about the movement of my teeth. In the end, I found that his treatment plan worked very well and I now have a gorgeous smile. Trust him, he knows what he is doing." "Dr. Briscoe and his staff are fabulous. They really have YOUR best interest in mind when they give you a complete examination. They offer, state-of-the-art treatment options so you can have the smile you've always wanted. If you read this and need a dentist, consider this office for a no-charge consultation." Interested in straightening your teeth, but unsure if Invisalign or Braces are the right choice for you? 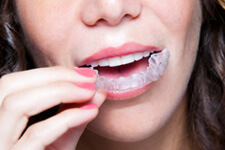 Read our Invisalign Vs. Braces page here. There is a misunderstanding among some dental providers that Invisalign can only be used to treat minor misalignment issues. If you have been told that you must have metal braces to correct your smile, you should schedule an appointment with Dr. Briscoe for a second opinion. Can Invisalign Can Be Combined With Traditional Braces? As one of La Jolla’s premier cosmetic dentists, he has a wealth of knowledge on using Invisalign alone or in combination with metal braces. He will give you an honest assessment of whether Invisalign is right for you either alone or with other treatment such as metal braces on a few teeth or using palate expanders or other devices. Is Invisalign More Effective Than Braces? In the vast majority of cases, Invisalign moves the teeth better than metal braces. Using custom made trays applies a pushing force in a multiple number of places unlike metal braces which apply a pulling force pivoted on the bracket on the center of the tooth. Using a treatment program for his San Diego Invisalign patients involving a short period of wearing metal braces, with the majority of treatment time using Invisalign is very popular. A few months of metal in the mouth is more acceptable than the usual 18 months to 2 years or more required in traditional programs. While Invisalign makes the process easier, the end result is a beautiful healthy smile. Deos Invisalign Require Brackets like Metal Braces? No, brackets are not necessary with Invisalign, because they are not attached to your teeth. Braces have brackets that are adhered to your teeth with an adhesive and are not removed until the teeth have all been moved into position and new bone has grown in around the teeth. The arched wire that goes through the slots in the brackets is held in position by elastic bands. The elastic bands provide the flexibility for adjusting the arched wires, which are the part of braces that are moved during the treatment period. Rinse the tray under lukewarm water. Using a soft-bristled toothbrush or a retainer brush, gently brush both the inside and out with, small circular motions. Rinse it again in lukewarm water to remove the toothpaste. If you notice a cloudy white film, this is tartar buildup and virtually impossible to remove with just a toothbrush. Soak the tray in any denture or retainer cleaner solution, per directions on the box and they will look good as new. Is Invisalign Painful, like Metal Braces Are Known to Be? Any orthodontic treatment that is shifting the position of your teeth will have some pain associated with it, but Invisalign aligners are typically far more comfortable to experience. Most patients adjust to having the aligners within a few weeks and experience only mild discomfort when a new aligner is used. As a top Invisalign dentist in La Jolla, San Diego, Dr. Briscoe will help you decide if Invisalign should be part of your Smile Makeover. The best way to find out if you are a candidate for Invisalign is to schedule a consultation with Dr. Briscoe at his La Jolla dental spa. In a consultation, you can ask all of your questions, and find out how we can provide you with the best results in Invisalign La Jolla has available.